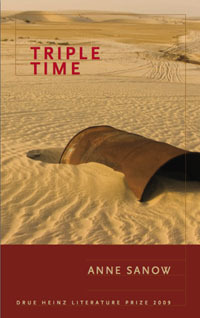 Recently, we nano-interviewed author Lucy Honig, and in looking into the Drue Heinz Literature Prize (which she won in 1999), we were pleased to discover that the 2009 winner lives right here in the Bay State, too – Anne Sanow of Provincetown, who won the award for her short story collection Triple Time. Drue Heinz judge Ann Patchett said that Anne’s stories (which explore expatriates and natives in contemporary Saudi Arabia) reminded her “why writers are willing to judge contests” (which resonates with those of us who are often asking writers to judge contests). Currently on the road for book readings and numerous award festivities (along with the Drue Heinz, she recently won the Nelson Algren Award), Anne poked her head into ArtSake’s webby window to share her thoughts on longhand experiments, on-the-spot abridgements, and that awf’ly nice compliment paid to her by the man in the bolo tie. ArtSake: Who wins the poets vs. prose writers paint ball war? Anne: Prose writers, of course — the poets would need to take too many breaks to write down how they feel about it all, making them sitting ducks. I wouldn’t want to get into it with the painters, though. ArtSake: Computer, longhand, or typewriter? Anne: Longhand for experimentation — and I’m particular about where it goes. I carry around a small Moleskin for random things and notes, and use those larger black-and-reds (I get them from Pearl River Mart in New York) dedicated to specific projects. I cannot write in anything that isn’t college ruled. I use the computer for serious, lengthy composition because it puts words into type so quickly; seeing it helps me visualize prose rhythm as well as hear it, and this is an important part of the whole process for me. I also like to re-type entire stories or sections when I revise. ArtSake: Do you ever revise your work on the spot during live readings? Anne: Yes — sometimes it’s only while reading in front of an audience that I realize a certain beat or repetition or omission is going to be more effective. I’ve also skipped entire paragraphs of exposition to keep the momentum going (or when someone in the audience looks to be falling asleep!). Active listening is quite a different experience than reading alone, so I don’t think that what’s printed on the page is necessarily sacred. ArtSake: What’s the most surprising reader response you’ve ever received? Anne: I gave a reading at a bookstore/cafe in Buffalo, Wyoming, when I was there for a month at the Jentel Artist Residency program. Afterwards this elderly gentleman (he was 80 if he was a day) wearing a checked western shirt with a bolo tie, pressed jeans, and cowboy boots came up to me and said, “That was a right nice job you did there, missy!” It was definitely memorable. Anne joins Ann Patchett (the judge for the Drue Heinz award) for the Drue Heinz Literature Prize Reading and Award Ceremony, Wednesday, October 14, 7:30 PM, at the Frick Fine Arts Auditorium at the University of Pittsburgh, Pittsburgh PA. Next month, she’ll join poet Nancy K. Pearson for a reading at the Fine Arts Work Center in Provincetown (where both writers were fellows), on Saturday, November 21, 8 PM. Anne Sanow was born and raised in California and moved to Saudi Arabia for two years following her high school graduation. Her stories have appeared in Dossier, Kenyon Review, Shenandoah, Crab Orchard Review, and Malahat Review, among other publications, and have been nominated four times for the Pushcart Prize. “The Grand Tour,” one of the stories in her story collection Triple Time, won the 2009 Nelson Algren Award from the Chicago Tribune. She currently lives on Cape Cod.